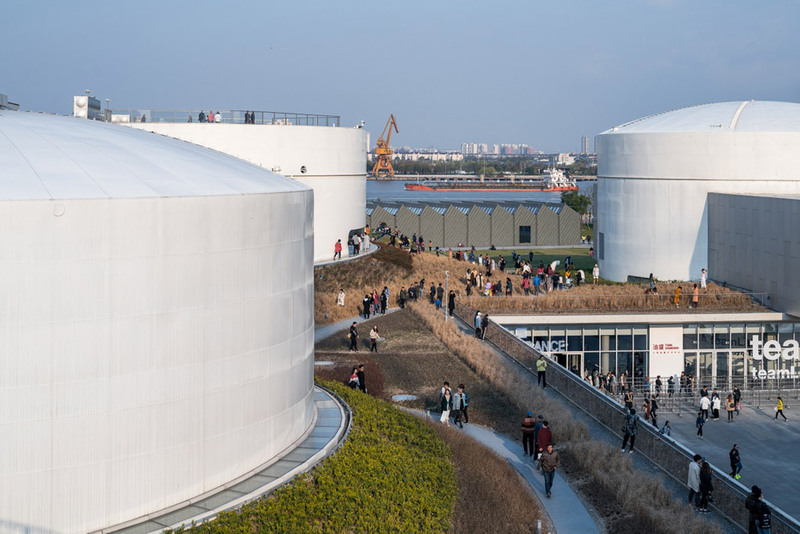 Five aviation fuel containers on the former Longhua airport in Shanghai have been transformed into art and culture park Tank Shanghai, by local studio Open Architecture. Open Architecture has created 60,000 square metres of gallery space on the former industrial site, for Chinese collector Qiao Zhibing. Tank Shanghai sits atop a landscaped “super-surface” – a newly constructed ground level that provides undulating green spaces and squares above, and seamlessly connects each tank together below. 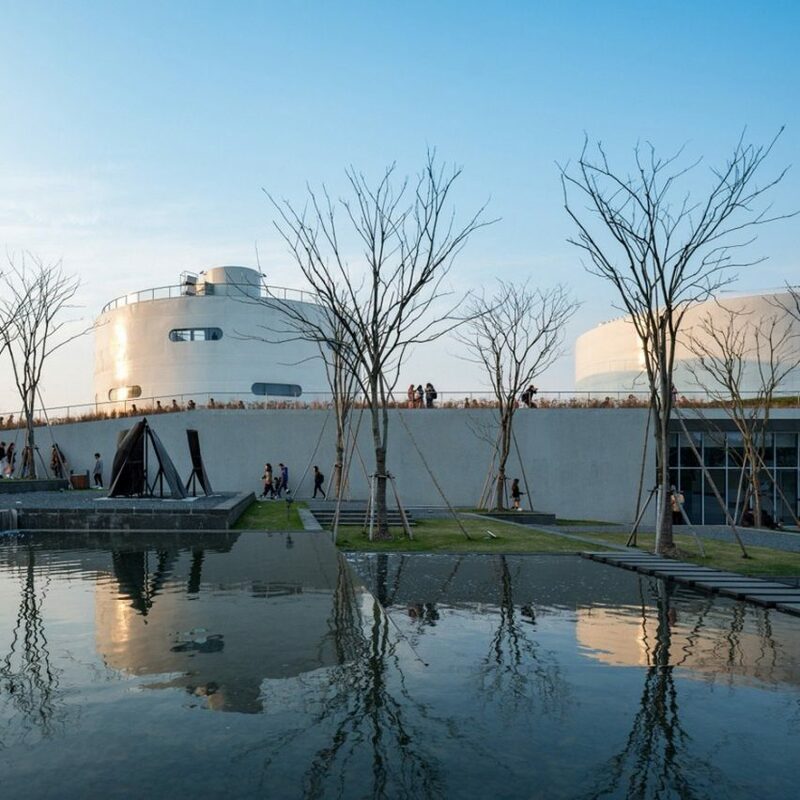 “This project is a story about how industrial relics are reincarnated through art in a new era of city development,” said the studio, which is led by architects Li Hu and Huang Wenjing. 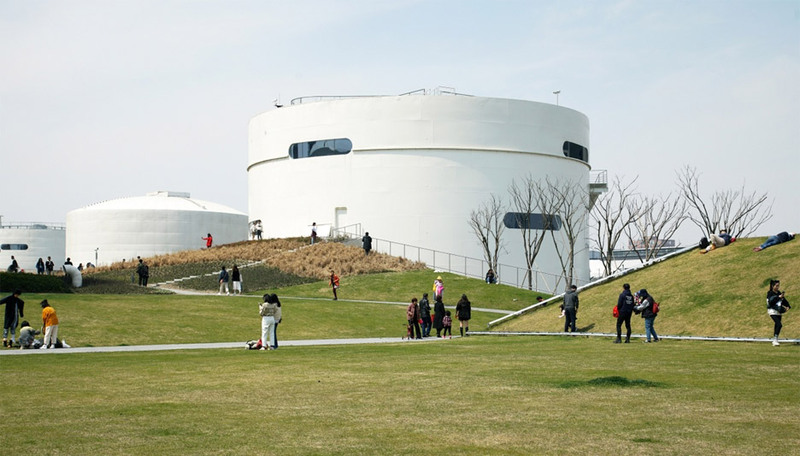 Two of the tanks are now art galleries – one is finished like a traditional white cube, while the other has its original interior surfaces left exposed. The other three are multi-functional exhibition, leisure and activity spaces. 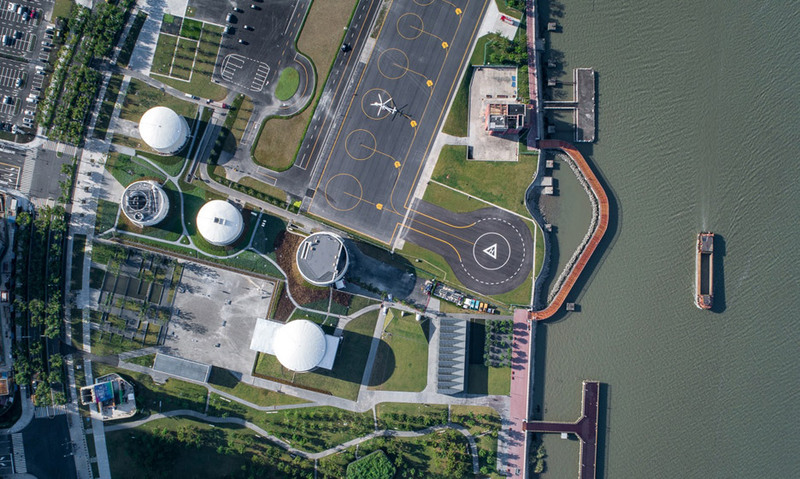 “Each of these transformations, which thoughtfully preserve and in some cases retain largely untouched the original features of the tanks, had to overcome significant design and construction challenges posed by the constraints of working with the existing structure of each tank,” explained the architects. Standing as distinct forms in the landscape, below ground the tanks appear as large atria, surrounded by sweeping staircases leading up from the concrete underbelly of the super-surface. 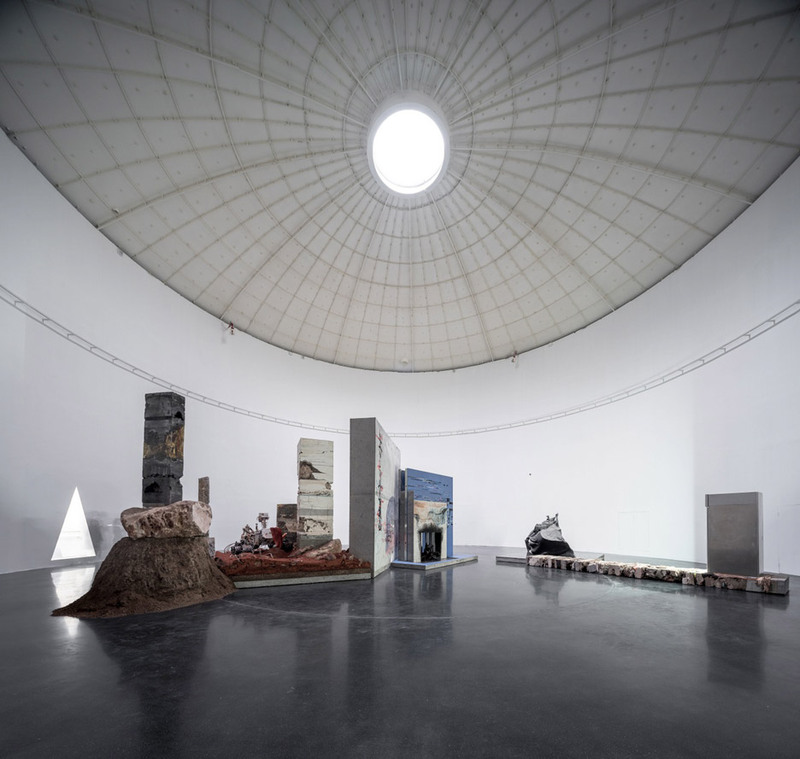 New windows and skylights in the tanks help draw natural light into the Tank Shanghai exhibition spaces. Two large public squares, called the urban plaza and the event plaza, sit within the landscaped park, designed as spaces that can host ceremonies, parties and performances. 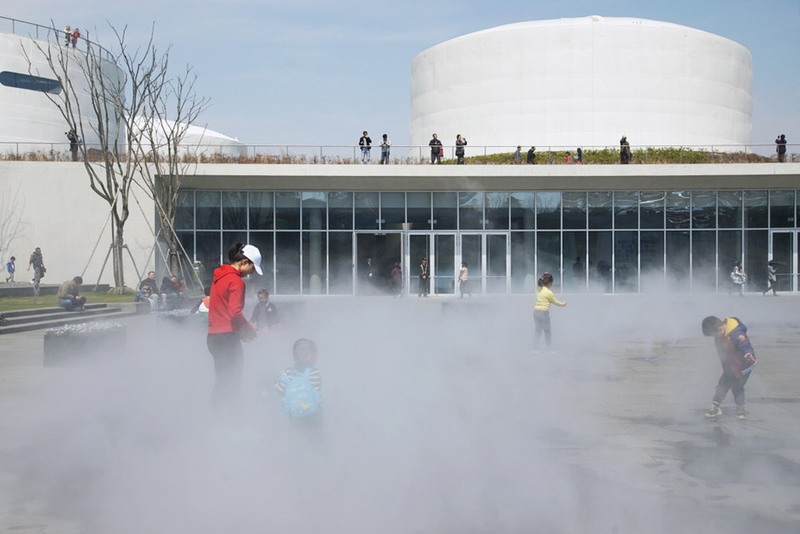 An embedded misting system in the event plaza can transform the space into a “foggy field”. To the south, an “urban forest” stretches the length of the site. Alongside the event plaza at the east of the site, a former water-pump house will be transformed into a separate project space for art events and small exhibitions. 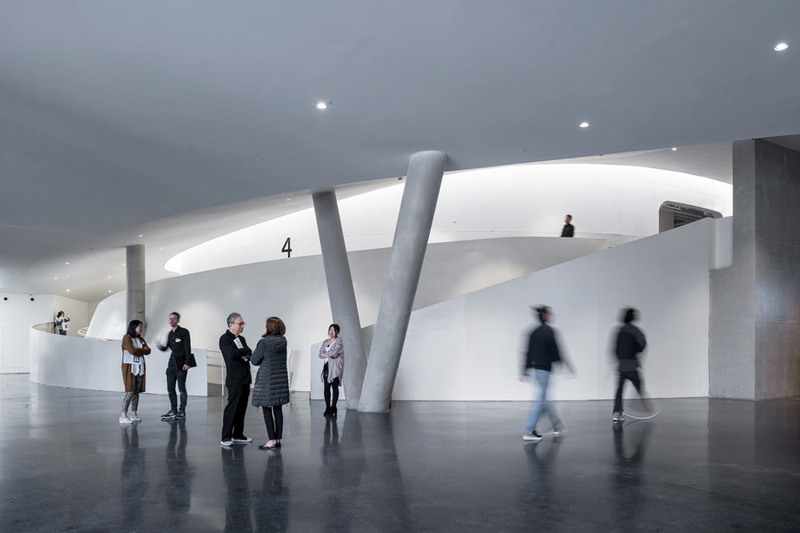 Open Architecture also recently created a subterranean space for the UCCA Dune Art Museum in Qinhuangdao, where a cave-like network of galleries sits underneath a sand dune. Photography is by Wu Qingshan unless stated. The post Open Architecture converts airport fuel tanks into gallery spaces appeared first on Dezeen.